So we’ll carry on with the swing-top even though the swingy bit has disappeared (must’ve fallen in) and it’s just a big hole. MK doesn’t care about having all our peelings and fag ends on display. I’ve now got into the rhythm of this book and worked out who the characters are: MK (Mary-Kay) is the mother that Nina is employed by, to look after her two children, Sam and Will. At the time Nina is employed Mary-Kay is the editor of London review of Books and their regular visitors include Alan Bennett who always appears to come armed with his top cooking tips for Nina. This book is making me smile with her fresh look at life and haphazard approach to running a household. I really need to try to find this book . . . I still smoke (don’t tell anyone as it is very socially unacceptable) I usually say I’m going for a ciggy.. I could easily immerse myself in this story…thanks for sharing. Love that cover, too! 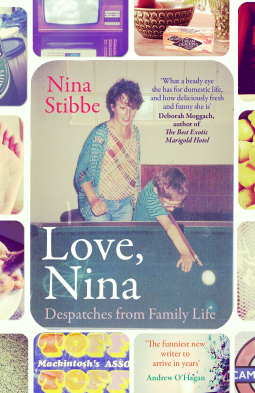 The cover is really good and Nina’s take on life is priceless at times…. Sounds interesting. Not what I expected. Enjoy! Thank you Linda, it is a fun read and because it is letters it is easy to pick up and read a few between other things! I tend to go in for haphazard housekeeping myself, so i can relate. Thank you! The book is good fun! Happy Sunday! Looks an interesting read, Cleopatra.